Making prints sounds simple at first — just hit the print button, right? Well… yes and no. Prints can actually be quite involved depending on how far you want to go with them. Once you cross the line of producing a signed print, you’re basically putting your integrity on the line. A signature is a “seal of approval” when it comes to prints, and this is something you shouldn’t take lightly. 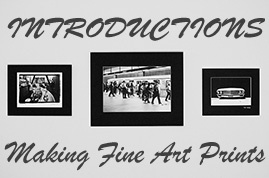 UPDATE: I’ve changed the title of the series from “Making Prints for Display” to “Making Fine Art Prints”. I think it’s more fitting for the topics we’ll be discussing. Signing prints seems to be a “hidden secret” for those who haven’t done it yet. Nobody really talks about it! In addition, signed prints tend to go beyond just a signature: prep, print, frame, ship, etc. But don’t get overwhelmed — there’s a common theme among all of this: “the photographer is in-charge of the final product.” Whatever you decide to do, there’s no wrong answer. The discussions that follow are not intended to be hard-set rules, only suggestions and guidelines. DISCLAIMER: Let me get this out of the way right up front… I’m not a professional artist, I don’t do this every day, and I don’t know all the answers. I’m going to rely on the audience to help fill in some of the blanks along the way. I’m also not a lawyer, and the discussions in this series may or may not apply to things like “limited editions” from a legal sense. I also have to give credit to Justin Korn for instigating this discussion. He asked a question about signing prints via FriendFeed, and the discussion exploded (see here). I quickly realized that the topic was of value to more than just one person, so I figured we could open things up here on the blog. PREPARING – Making decisions prior to making the print and how those decisions will effect subsequent steps. PRINTING – How to produce the best quality work and how to handle the finished product. SIGNING – Placing your “seal of approval” on the print and a discussion of the various methods for doing so. FRAMING – Mounting, matting, and framing of prints as an optional step in the process. SHIPPING – Once everything is done, we’ll talk about how to get the print packaged and shipped to avoid damage. This whole series of articles will be quite open to discussion, suggestion, and modification. Right now, I’m asking you to provide feedback on the main topics and the subtopics contained within. Are those 5 main topics enough to cover all of your questions? And what specific things would you like to see discussed in each one? As we dive into each topic, I’ll present material based on what I know. Then, I’ll ask all of you to provide feedback and additional knowledge on the subject. After posting each article, I’ll let the comments run wild for a few days and then I’ll take some of the better comments and place them back in the main article (with attribution, of course). In the end, we should be able to produce a good resource for the topic of producing prints for display… maybe even another eBook. What Exactly is a “Limited Edition” Print? This entry was posted in Features, General Tips and tagged art, display, foto, frame, intro, mat, photo, photography, photos, print, series on May 19, 2009 by Brian Auer. Glad to see this topic come to life! I think the main issue I’m having right now is since I use an online printer, I like to have the prints shipped directly to the client. However, with a fine art print, there comes the questions about signing or as you put it placing a “seal of approval” and then getting the final product out the door to the client. Justin: My suggestion would be that if the print is important/valuable enough for you to consider it a fine art print, or if it is a limited edition, or if you’re ultimately concerned about the final print quality, that you don’t ship directly to the client. Especially if you consider it to be a fine art print. I use online printers as well, but I will not provide it to my clients until I’ve personally inspected each print to ensure there were no problems with the print (colour shift? bent corner? wrong cropping?). And when it passes my test, I sign it. If I was just banging out a little print and selling it for $30 or something, I wouldn’t bother.. but I wouldn’t be affixing my signature to it, and thus standing by the quality of it. Thanks for taking on this series as I and I am sure others would like to know more about this subject. This is one of the artist type areas were there are no concrete formulae for approach but more about quality of product and services. I would like to state that the print I got from you was perfectly printed nice subtle tones and came via secure shipping. I enjoy looking at very much. I look forward to these topics. I’d like to hear how other artists handle open edition vs limited edition situations. Do you issue a limited edition of an image and then, when it sells out let it go to open edition? Do you have both at the same time where LE’s are signed & OE’s aren’t? Do you not issue OE’s of the same image as LE’s at all? Do you use print on demand services (where the printing company mails direct to customer) for OE’s and print your own LE’s? If you use print on demand, do you have a digital signature on the image, or a border with the image title and your name, or something else? To each their own, but for me I only offer limited edition signed prints. And when those prints have finished their run, I delete the source file. To have open edition and limited edition of the same print defeats the purpose of having a limited edition print (and I think lowers its value). Same thing with having a subsequent open edition run. I print from an online lab, and have them shipped to me so that I can inspect them for quality (and sign them). I have decided to sign them on the back. I struggled with this decision (whether to sign front or back) a bit. I might change this in the future, but for now I sign the back of the print with an archival pen. I am doing open editions, and I am not really sure I understand the purpose of a limited edition. I mean, I am not Ansel Adams … so will anyone really care that much about whether I printed 100 or 1000 of the same photo? Great idea to get other people’s feedback about this criteria. I am using an online printer as well and get it shipped to my house first. Like other people here said before me just to make sure the print looks really like I want it too.Shipping it directly to the customer defeats the purpose I think. At the moment I just had customers where I also provided the matting for the print, so I was signing the mat and the back of the print. I will move away from that, it’s just too much work and I want to concentrate on task of taking pictures instead of how to display them. However some times it is nice to be involved in that process too. I have a client right now and she wants a big print on canvas. I know where it will hang in her house and that’s just great. Question now is, how and do I sign it? To the limited or not limited editions. I think for people in general it’s nice if they have something they really like to have it also as a limited edition. Just a feeling. I’m a collector of records and having that limited edition piece is just the best feeling! Just a thought. I would recommend signing the back of the canvas with an archival pen. However, you should test it first to make sure it doesn’t leak through. The old tradition was to sign the back in pencil. However, I think this was before the newer, slicker back papers were around, which make using pencil difficult. In my research, I’ve found there isn’t really a standard anymore. Comes down to what you are comfortable with. It’s great to see the questions showing up like this, and as I expected most are around the actual signing of the print (that particular article may be a very large one). I’ll definitely address as many of them as possible in the upcoming posts. Keep ‘em coming! I’m really looking forward to this series of articles. I’ve been reading the blog for quite a while now and there’s always something interesting in the new posts. I just finished a B&W photo class, and the professor recommended that I enter a local photo competition that is going to be held soon. The problem is, I haven’t been through the whole process all they way to matting and framing a print, so I’m hesitant to do it right now. I’ll definitely be keeping up on the comments here so that I can gain some insight into making a fine print and finishing it off to be displayed so that I’ll be ready to enter some of my work next time around. If your only hold-up is matting and framing, go see a professional art framer! They do that stuff for a living and they’re more than willing to work with you, even before you’ve actually printed your photo. I should also state that when we cover matting and framing in this series, I won’t be going into the details of doing those things yourself — that’s above my head and a topic that could require a whole series of articles by itself. But we will talk about the things you’ll need to know in order to make the decisions for the process. This is a great topic to pursue, and I am glad you are going to attack it from multiple angles. My personal interest would be around printing, and mostly printing at your personal dark room. I guess I left out a detail that makes it a little harder for me: All entries have to be for sale if they make it through the initial selection process and into the subsequent show. So now I have to figure out what to print it on (fiber or RC), how much to price it, and how my perceived value of the print should compare with the cost of the frame/matting, and do I sign it or not. That’s on top of the thought’s of “is this really good enough?” that go along with having your work viewed/criticized in a new way. Hope that clears it up. I guess I’m hitting a point where I know I want to get my work out there at some point in the future, and I’m hoping to pick up on some of the tips/advice that everyone here has to offer. Also, something I’m wondering is how do you all differ your presentation methods between an entry in a contest vs. selling a print to a person, if at all. For example, do take into account the environment that it will be displayed in, or do you just figure out what you want for that print and always stick with it regardless of where it will be displayed. Thank you for an informative article. I have been leaning towards selling some nature prints and really needed this inforamtion. Thanks again! Very much looking forward to this — in particular thoughts on current printing technologies, and ideas on framing. RSS up and running for this! Sean makes a very good point. To each their own, but for me I only offer limited edition signed prints . . . To have open edition and limited edition of the same print defeats the purpose of having a limited edition print (and I think lowers its value). Prints I issue as “limited edition” have no “open edition” option and I also don’t license them for editorial or commercial use. I believe that would lower the perceived value of the limited edition print. Great series Brian. I discovered it searching for info on how to price art prints. Any plan for broaching that topic? Pricing is always the BIG QUESTION MARK. You want to price appropriately but at the same time you don’t want to price too high or a sale never occurs, or too low, which can negatively affect perceived value and the whole marketplace. Adding pressure to your pricing is what other artists in the same general genre are doing. So there is “market pressure” that will affect your prices. Price yourself too high and you price yourself right out of the market. I’ve actually experienced an “increase” in sales when I RAISED my prices. Interesting. In my experience I believe it comes down to “perceived value”. The buyer is always thinking . . . Is it worth what the artist is asking? Are there smilar pieces out there for less? Is the artist well known? How long will the piece last? Am I buying because I like it, or because I’m investing in it? The art market place is like a bell curve. At the lower end are buyers that can only afford the price of a poster. At the top end are buyers that can afford high end originals and who feel comfortable spending $1,000 – $10,000 (or more) for a work of art. Then there is the largest marketing segment, in the middle that are comfortable spending several hundred dollars for a reproduction or original piece. Visit the websites of well known and less well known artists and see what they are asking for their art based on media, size, how many in the series, etc. This will give you a pretty good idea of what to charge. There will always be “outriders”, artists that are charging inappropriately for the market so toss out the obvious outriders when doing your research (low or high). Pricing your work can be complicated (and heart wrenching) but it can also be fun. I actually enjoy figuring out what to charge for a piece. Great points, Oscar. I agree that pricing work is a difficult task, and that it should be more than a random number. Charlie, I’m hesitant to throw out any numbers because every artist’s situation will be different. You have to take into account things like the cost to produce the piece, the scarcity of the work, perceived value, popularity of the artist, the general “interesting” factor of the piece, and many other things. Like Oscar said, see what others are doing to get a feel for the numbers. I might open this topic up with another blog post, but I’ll need to spend some time wording things correctly so I don’t start an argument rather than a discussion. If you’re looking to price your first exhibition, consider 3-4 x’s the cost of your materials. So, if it cost you $25 to print and frame, look at the $75-100 range. It is easier to go up from there than it is to go down. I wouldn’t worry about undercutting yourself or anyone else when you’re just getting started. Sean is right on target. Just don’t price your prints the way I see some beginning photographers price them. $5 for an 8 X 10. Limited Edition prints should be priced higher than open edition prints.